Consider the best sporting themed video slot games online as another way of gambling on sports. Betting at bookmakers is the most straightforward way to get money and fun from sports events. But one more entertaining play related to sports-themed games is to gamble on slot machines. Free spins, bonus rounds, and multi-million jackpots there are somewhat you couldn't find in sports betting but would enjoy at video slots online. Read our review about the most interesting gambling machines inspired by sport. Probably the most popular online slot game related to sports from Playtech. 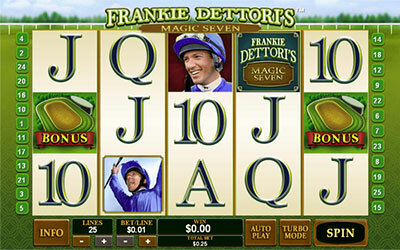 This gambling machine is dedicated to the famous Italian jockey Frankie Dettori and his miraculous number 7. He once set the record winning all seven races at Ascot. The Frankie Dettori's Magic Seven is a 5 reel and 25 pay lines slot with possibilities of bonus games and free spins rounds. You may change the number of playing lines from 1 to 25 as well as bet sizes ranging from $0.01 to $20 per line which makes $500 for max bet. The top paying combination is five wild symbols which pay 7777x that means maximum possible payout for this sports-themed slot game is $3,888,500! A bonus game is triggered when you pick up bonus symbols on reels 1 and 5. You may enjoy bonus games at the Frankie Dettori's Magic Seven Slot more often than at other gambling machines where you usually need to catch at least 3 bonus symbols instead of 2 here. During the bonus game, you need to open sectors of the racetrack hiding money prizes and win multipliers until you see a "collect" mark written over one of them. A free spins round is won when you collect 3 or more scatter symbols anywhere on the reels. One more pleasant aspect of this slot is revealed when you get only 2 scatters which pay your stake back to you instead of nothing as usual at most other gaming machines. The number of free spins you will know after a mini-race where you must choose one of three horses and the place your horse finishes on defines your number of free spins in this round (10, 15 or 35). This is a curious 5-reel, 243-line online casino game for basketball fans. 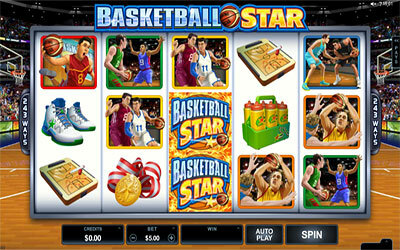 Surroundings of this sports carefully included in every detail of the Basketball Star Slot. The bet size varies from $0.50 to $50 according to your needs, but it's impossible to alter the number of lines. Maximum proposed winning is $120,000. This gambling machine is rich in various features which deservingly brings it into the top online slots based on sports. Besides pretty standard Free Spins awards, there also Rolling Wheels, Wild Shot and Stacked Wilds features. Rolling Wheels mean that the slot will keep its reels moving after a win to increase potential earnings. Winning combinations on reels may suddenly collapse and reveal new symbols to win. Wild Shot occurs when reels 2, 3 or 4 randomly turn wild for a guaranteed win. Reels 3, 4 and 5 also include Stacking Wild symbols which expand onto the entire reel and maximize winnings. 15-25 Free Spins are awarded when three or more scatter symbols appear on the screen. They come with progressive multiplier increasing from 2x to 10x after consecutive wins. Another sports-themed gambling machine from Microgaming inspired by a popular football magazine of the same title being published in the UK decades ago. Here you meet a handful of football stars from the XXth century - the likes of Pele, Cruyff, and Maradona, to name a few. The Shoot! Slot has 5 reels and 50 pay lines which greatly extends the ways you could win. You are able to change the number of lines (from 1 to 50), the number of coins per bet (from 1 to 20) and the value of a coin (from $0.01 to $0.10) up to max bet of $100, which provides great opportunities to control your gambles finely. The maximum winning multiplier at the Shoot! online slot is 750x. This online game carries some interesting bonus features. To activate a feature, you have to collect 3 or more Scatter symbols regardless of their positions on the reels. Initially, they open the Trade 'Em Bonus feature where you are offered to choose 4 out of 12 cards with cash prizes. If you are lucky enough, you will avoid a red card that brings the end to the feature. Instead, you could activate two additional bonuses - the Magazine Bonus and the Free Spins Bonus. The first one is similar to the initial feature and shows you 12 magazines where you need to pick cash prizes from until you see a red card. The free spins round rewards you between 10 and 35 free spins with a 2x multiplier. This is a more complicated slot machine provided by Playtech. It consists of 5 reels like many, but they are stacked in 4 lines instead of traditional 3. Nevertheless, this sports-themed pokie offers not more than 40 pay lines. As you probably guessed right, it is tennis influenced. 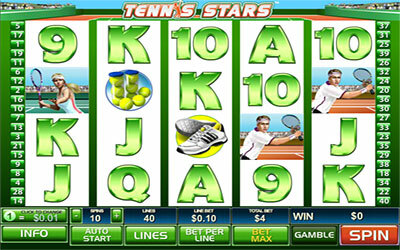 The Tennis Stars Slot allows you to change the number of lines (from 1 to 40), the bet per line (from 1 to 10 coins) as well as the value of a coin (from $0.01 to $0.50) which suits perfect as for micro stakes gamblers, as for high rollers willing to spend $200 for a single spin. The best-paying symbols are a man and a woman tennis player, which 5 of a kind returns 5000x in winnings which means a whopping one million dollar cashout from a max bet if you will be fortunate. The outstanding feature of this sporting casino machine is the fact that wild symbols play as bonus ones at the same time. It is very convenient as scatters never occupy valuable spots on the reels in vain here unlike in many other slot games. You still need to collect three wilds to trigger a Free Spins round (with a 3x multiplier), but even if you catch one or two, you will be rewarded almost every time with a simple line winning. There are also true scatter symbols which need to be three of a kind to start a Championship bonus game. But one more surprise hides here: even only two scatters still pay you 2x of your bet. The Bonus game is a tennis match against the computer. You need to decide whether you prefer to play as a woman or a man and then choose a type of your serve: a flat serve or a slide one. Depending on how successful your serves were and what an overall score of the match is, you earn between 10x and 250x multiplied by a size of your bet as a result of the bonus game. 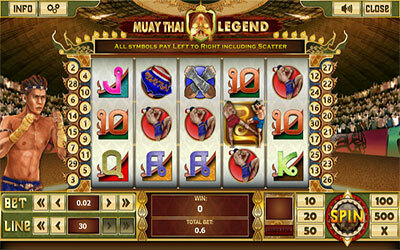 This is a rare slot game about an exotic asian sport available online only on asian websites. It has been created by Neuvasys and features 5 reels and 30 pay lines exploiting the Muay Thai martial art theme symbols: kaad chuek, mongkol and so on. You may vary the number of lines (from 1 to 30) or your bet size per line (from $0.01 to $0.50) which allows you to wager maximum $15 for every spin. It serves nice to control your gambling habits. This game pays up to 2,400 times from your total bets. Three or more scatter symbols will reward you Free Spins (from 6 to 20). You may choose either more free spins with lower multiplier (20 and x3) or few free spins with big multiplier (6 and x10) or somewhat between (12 and x5). There are wild symbols in the middle reel to extend winning opportunities. Two scatters are also goods just paying 2x of your total bet. During free spins, you could additionally trigger a bonus game catching the bonus symbols on reels 1 and 5. In the bonus draw from 6 cards where 3 blue cards indicate player attacks and 3 red cards symbolize the enemy. Challenge and defeat the Muay Thai Champion and earn up to 50x winnings! Slot machines, also known as "one-armed bandits", are video games of chance developed in forms of matrices of three or more virtual reels with sets of symbols. A gambler chooses the size of money bet, number of active lines, and then activates a spin pressing a button. Every spin produces a random combination of symbols. Several consecutive symbols of the same kind on an active pay line generate winnings according to the rules and paytables of particular gambling machines as a multiplier from total bet or line bet amount. Maximum winnings may reach some thousandfold of one wager. There are also special symbols like "wild", "scatter", "bonus" which may bring various additional rewards sometimes regardless whether they are on a pay line or not. A number of free spins may be achieved on some slots under certain circumstances meaning no money is deducted from a player's balance during that spins but the winnings are calculated according to the bet set at the moment the free spins have been triggered.